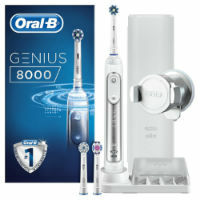 The Oral-B Smartseries 4000 and 5000 are closely matched however the Oral-B Smartseries 5000 just wins. 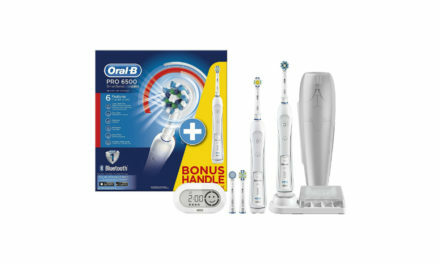 The extra features included in the Oral-B 5000 make it worth the added expense. So which Smartseries electric toothbrush should you buy Oral-B 4000 vs 5000? They are both high tech, mid range electric toothbrushes with price tags between £50-80. Which one represents better value for money? I put the Oral-B 4000 and 5000 in a direct head to head to find out which one is the better electric toothbrush. The Oral-B Smartseries 4000 and 5000 held side by side look identical. Both electric toothbrushes have a slimline profile and come in a dark blue colour. On the front of both the electric toothbrushes, there is an on/off button. This on/off button not only turns the electric toothbrush on and off but changes between cleaning modes. They also both have a battery indicator light at the bottom of the electric toothbrush handle. On the back of the Oral-B Smartseries 4000 and 5000 is the red visible pressure sensor (more on this below). Below this is a rubberized grip which is easy to hold even when wet. Both electric toothbrush handles are waterproof so are suitable to be used in the shower. Both the Oral-B Smartseries 4000 and Oral-B Smartseries 5000 have a quadpacer timer. 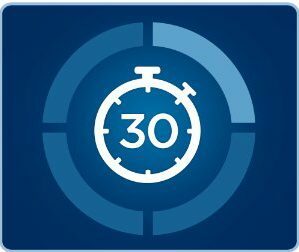 This is a brilliant timer that gives an auditory warning to change area of your mouth every 30 seconds. The timer then gives a double “buzz” once you reach the dentist recommended 2 minutes of brushing. When you first use this timer, the 2 minutes feels like a long time. This is because most people brush far less than 2 minutes. 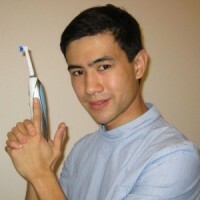 For anyone looking to improve their oral hygiene, the quadpacer is an essential feature on an electric toothbrush. A visible pressure sensor is a key feature on any good electric toothbrushes. Both the Oral-B Smartseries 4000 and 5000 have this feature. Every time you press too firmly with these electric toothbrushes, the rear of the electric toothbrush handle flashes red. This makes it easy to see whilst brushing and allows you to gauge the correct amount of pressure you are meant to apply. The amount of pressure you are meant to apply whilst brushing is 150 grams or the weight of an orange.Too firm pressure whilst brushing can lead to premature gum recession and sensitivity. Both the Oral-B Smartseries 5000 and 4000 have Bluetooth technology. This allows them to connect with the Oral-B app via your smartphone. 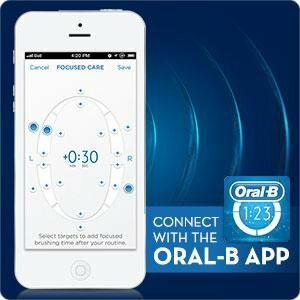 The Oral-B app is available on itunes or android. 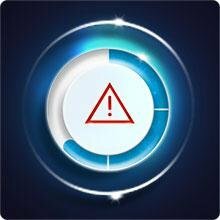 Once connected to the Oral-B app, the Oral-B Smartseries 5000 and 4000 is converted into a oral hygiene motivator, reminding you when to brush your teeth, how to brush your teeth and tracking your progress with badges and achievements. 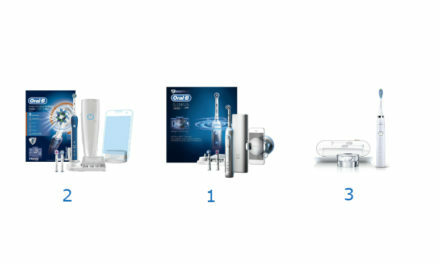 The Oral-B Smartseries 4000 and 5000 both have the exact same range of features. Therefore this round is a tie. The Oral-B 4000 and 5000 both use the excellent 3D oscillating rotating action to clean your teeth. This has been shown to better than a manual toothbrush and Philips Sonicare at cleaning teeth. The 3D oscillating rotating action works by spinning and pulsating up and down. This motion effectively breaks up the plaque biofilm getting rid of the bacteria that cause gum disease and decay. Daily clean mode, the standard cleaning mode featured on almost all of the Oral-B range and my personal favourite cleaning mode for brushing with. The brush head oscillates 8,800 times and pulsates 40,000 times per minute for the recommended 2 minutes. Gum Care mode, a pulsating cleaning mode that varies the speed of the brush throughout the 2 minutes. The idea behind this mode is that it massages the gums. I do not use this cleaning mode as it is not evidence based. Whitening mode, another mode I almost never use. This cleaning mode lasts for 2 minutes and 20 seconds. The extra 20 seconds allows you to polish your front teeth for an extra amount of time. Gimmicky in my opinion. The Oral-B Smartseries 5000 does have more cleaning modes but the functionality of the whitening mode is questionable. The Oral-B 4000 and 5000 are both completely compatible with the Oral-B’s phenomenal range of brush heads. Not only are the brush heads varies but they are also well priced when compared to the Philips Sonicare range. The Oral-B Smartseries 5000 comes with 3 x brush head refills. These include the cross action, the sensitive and the 3D White Brush head. In comparison the Oral-B Smartseries 4000 comes with 2 x brush heads inlcuding: the Cross action and sensitive brush head. The cross action is my favourite brush head in the range because of the small head size coupled with the specially formulated 16 degree bristles. The small brush head size allows you to clean even the most difficult to reach molars and the 16 degree bristles ensure you can clean along the gum line. The gum line is one of the most frequently missed areas whilst brushing. The battery life for both the Oral-B 4000 and 5000 are sub par for a mid range electric toothbrush. Both should last for 28 minutes which is one week of use twice a day for 2 minutes. On my test the Oral-B Smartseries 4000 and 5000 took 7 hours to charge from flat. This means that if you leave the electric toothbrush over night it should be fully charged in the morning. The charging stations featured on both the Oral-B 4000 and 5000 can hold 4 brush heads. This is particularly useful when you share the electric toothbrush handle amongst multiple people. As with almost all electric toothbrush chargers, it comes with a 2 pin plug. If you have a shaving socket in your bathroom then you will not need to buy an adaptor. For everyone else you will need a 2 pin to 3 pin adaptor which can be picked up from most hardware stores and Amazon. The Oral-B Smartseries 5000 and 4000 both weigh in at 130 grams which is nice and light. This is easily light enough to carry in your hand luggage or suitcase when travelling. 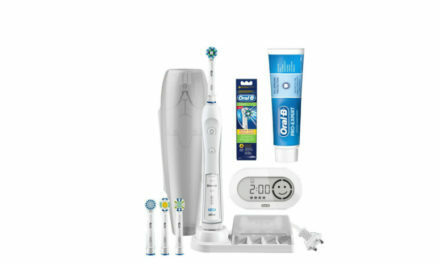 The Oral-B Smartseries 5000 does come with a standard travel case, that protects the electric toothbrush handle and 2 brush heads. This is a great feature and for those who travel often it is essential. For the Oral-B Smartseries 4000 you would need to buy the travel case separately, like the one below. The Oral-B Smartseries 4000 currently costs £54.92. The Oral-B Smartseries 5000 currently costs £69.99. 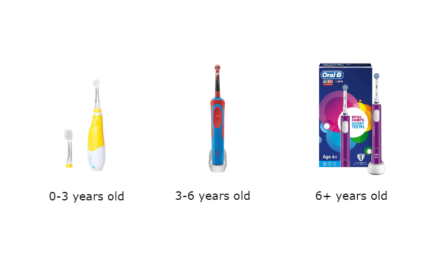 Both the Oral-B Smartseries 5000 and 4000 come with 2 year warranties that can be extended to 3 years via the Oral-B website. The running costs of these electric toothbrushes are minimal because of the cheap cost of the cross action brush heads. A 4 pack of cross action brush heads currently costs £10.94. This works out at just under £3 per brush head. Since brush heads should last a minimum of 3 months before they become frayed, this is only £1 month. Out of the two electric toothbrushes, in my opinion the Oral-B Smartseries 5000 offers the better value for money as it comes with a travel case, more brush head refills and more cleaning modes. So which one wins Oral-B 4000 vs 5000? Both these electric toothbrushes are closely matched however the Oral-B Smartseries 5000 just wins in this product test. In my opinion the travel case, the extra brush head and cleaning mode make it worth the extra price.